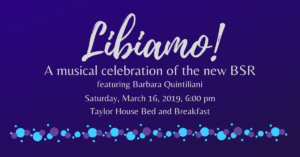 Celebrate the new Boston Singers' Resource website with board and staff of BSR, plus special guest Barbara Quintiliani. The celebration begins at 6:00, and music will start with a toast at 6:30. Raise a glass with us at Taylor House Bed and Breakfast in Jamaica Plain! Donations accepted at the door. Margaret will return to Riverside Theatre Works as Rose Lennox in The Secret Garden.